• reductions in low temperature extreme events and increases in high temperature extreme events such as El Niño-Southern Oscillation (ENSO). WGI also pointed out that modelling of climatic changes may involve uncertainties mainly because the parameterization of GCMs is still not perfect and because Earth processes still cannot be perfectly simulated (especially in regard to the interaction between clouds, radiation and aerosols). Nevertheless, the report did mention a significant improvement on the accuracy of past prediction of climate based on Earth processes modelled by the different GCMs. WGI, in reference to the TAR, concluded by stating that results of the models suggest that average surface temperature is likely to increase by between 1.4 and 5.8°C over the period 1990-2100, with general accordance between the different models for each single emission scenario. 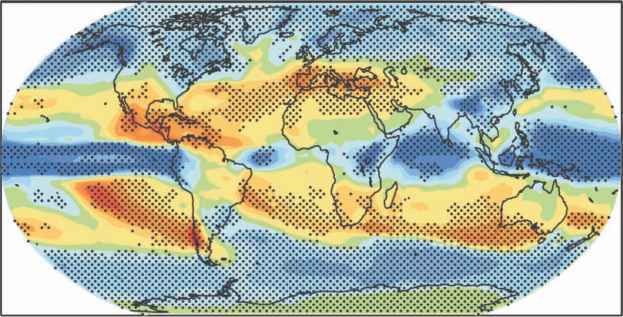 Northern high altitudes are presenting the highest warming rates during winter periods; precipitation will probably increase as a global average, but with significant regional differentiation (i.e. northern mid- to high latitudes presenting increases, and low latitudes presenting significantly different spatial patterns). 0.09-0.88 m for the full range of SRES scenarios (IPCC, 2001). This section provides a brief summary of the far more complete analysis of expected changes in climates contained in the IPCC FAR (2007). In mid- to high-latitude regions, models predict moderate to medium local increases in temperature (1-3°C) along with associated CO2 increase and rainfall changes to 2050, while in low-latitude regions, similar temperature changes (1-2°C) but far more complex spatial changes in rainfall are expected. Projected changes in the frequency and severity of extreme climate events have important consequences for food and forestry production and food insecurity in addition to impacts of projected mean climate (high confidence).